Although there was an increase in the number of properties for buyers to choose from last weekend, there was no obvious reduction in the number of bidders vying for properties this week – many auctions had three or more bidders. There were examples where vendor expectations were starting to creep beyond the market, such as 24 Byron Street, Kew – three bidders, passing in for $2,030,000 (selling after for an undisclosed amount). August is likely to see a steady flow of new properties hitting the net providing comfort for buyers in the shorter term. 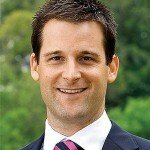 However school holidays start again in mid September and if you haven’t found the home you want before early September, there will be another fairly lengthy spell until November when the flow will improve again – due to school holidays and two public holiday weekends (AFL final and Cup Day). 72 Beaver Street Malvern East (James Tomlinson, Marshall White). A ‘half’ renovated home in the Gascoigne, on good land. Sold post auction for an undisclosed price in the higher $2millions. 30 Milton Street Canterbury (Brad Cooper, Jellis Craig). Good parcel of land, an older basic home with rambling floorplan, yet internally it did have a good feel in places. Buyer interest was split between retaining the home and a new build site, the eventual owner planning to live in as is. 66 Guildford Road Surrey Hills (James Tostevin, Marshall White). Solid original brick home, large land in one of the area’s premium streets. South-facing rear, block slope and future renovation/building work were the question marks. Although it took a while to get going, but it sold under the hammer for $2.46m – 3 bidders, well above the vendor’s market price of $2.03m. With increased interest buyer in development sites, 41 Atkins Street Kew sold for $4.325m – three units on approximately1000sqm all sold as one. This follows the recent sale of 12 Stawell Street Kew (3 units around $4,500sqm). Two similar offering for investors/buyers are 16 Oakleigh Street, Oakleigh East (Andrew Boyce, Hodges) auctioning on 29th August and one coming up in Hawthorn East. There are still a number of properties selling quietly or before auction. Peter Vigano (Jellis Craig) sold 1b Marlborough Street quietly off-market in the mid $3m’s. 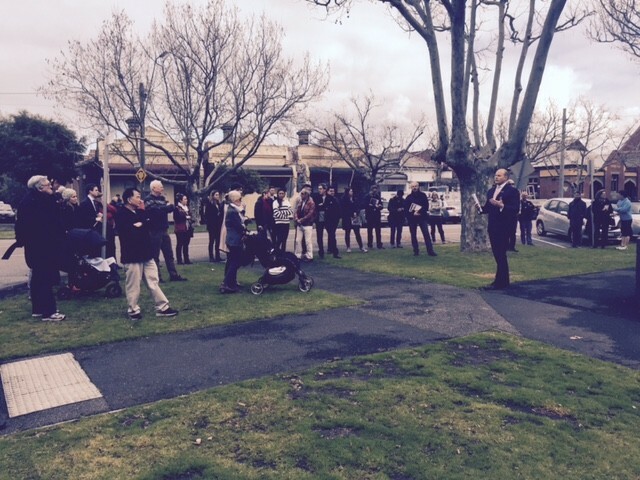 Rob Vickers-Willis & Jeff Gole (Abercromby’s) sold 53 Vincent Street Glen Iris $2.5m pre-auction. The auction of 888 Riversdale Road Camberwell didn’t necessarily live up to the hype on the weekend (sold on the 8th day of the 8th month, the number eight of course having good fortune according to Chinese culture), selling for $1,440,000 (or about $2,300sqm – which is fairly normal in the context of this current market, for what it was). With a huge crowd of around 90 people, multiple bidders & rapid-fire bidding throughout, this was a cracker auction all round. 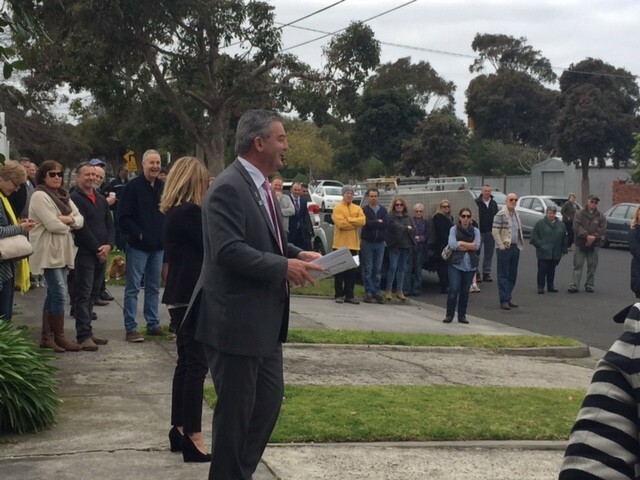 The spectators spread themselves out across and down the street – auctioneer Bill Jowett did a great job managing the bidding from all directions! A strong opening bid of $1.3m came from the crowd. Bidder 2 came in not long after at $1.31m and Bidder 3 at $1.35m. Bidding between the three continued before Bidder 4 entered the fray. More bidding, no half-time break and no “on the market” question, but when bids started trickling in at firstly $5k, then $2,500 increments, Bill announced that he would be selling to the highest bidder. 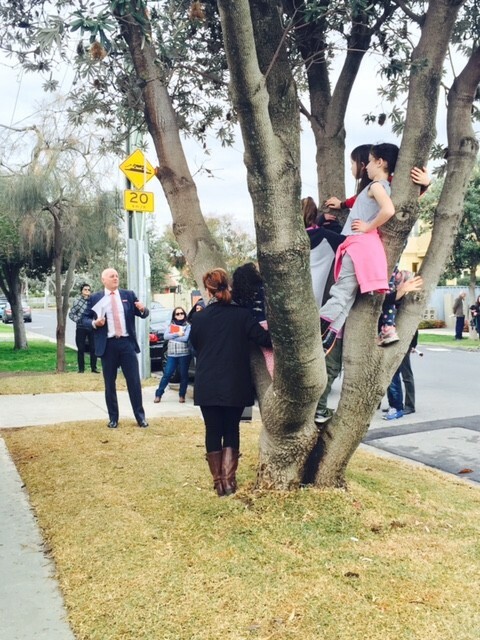 The hammer finally came down at $1.565m to a round of applause from the appreciative crowd. 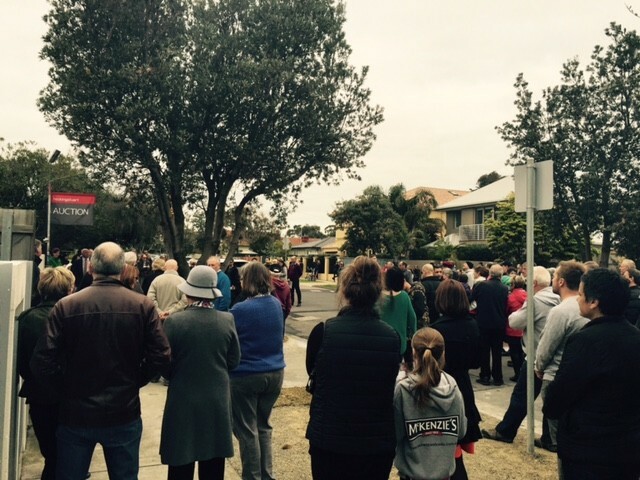 The first of the ‘non-identical’ twins – a pair of newly constructed townhouses just metres from Hampton beach – was how Peter Kennett described the property on offer to the massive crowd of over 120 people. Peter asked if there was a game on at the MCG because “everybody seems to be here instead!” After a dig at Carlton & Collingwood, and some subsequent chuckling from the crowd, a vendor bid of $2.5m kicked off proceedings and Bidder 1 chimed in $2.525m. 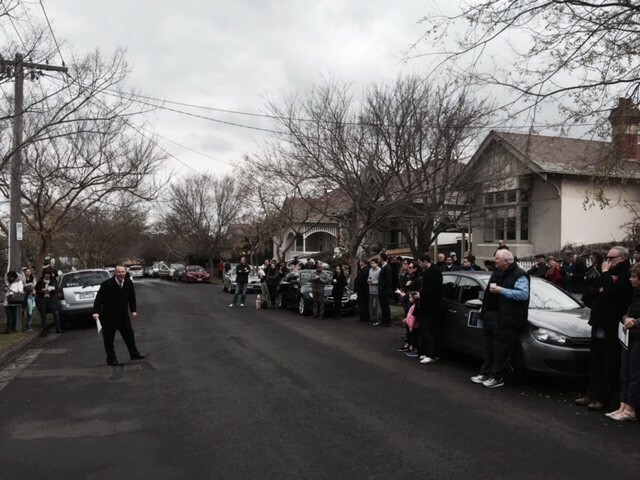 Bidder 2 entered soon after and at $2.6m, Peter & Jenny Dwyer ducked in to speak to their vendor. Back outside, some more bidding and at $2.71m Peter announced he would be selling. More bidding and at $2.85m the hammer came down to cheering and clapping from all in attendance. The second, and slightly smaller townhouse but still featuring spectacular bay views, 3 bedrooms, pool, basement garage and luxury appointments, went to auction just minutes after its next door neighbour. The spectators that had remained after the previous auction wondered in earnest whether the under-bidder would be successful the second time round. We didn’t have to wait long to find out. Peter was quick to start the contest, opening with a vendor bid of $2.4m. Our under-bidder tabled $2.425m and, with no one else in contention, Peter quickly passed the property in – “Let’s go buy a house,” he enthused as he ushered the family of four inside. Sold after auction for $2.59m. Agent Opinion: How are prices in your area compared to this time last year?